Dual boiler, dual PID commercial lever beast! This beast started out life as a La San Marco 85 series, single group volumetric heat exchanger. I bought it last year as a fixer upper, the boiler was over filling and it needed a general going over. 9 months or so later and it’s a very different machine to the one that came in! Turns out the over filling problem was a fractured heat exchanger, so that ruled out keeping the machine conventional – the heat exchanger would have to be decommissioned, capped off and become part of the steam boiler volume – I didn’t like the chances of a successful repair. At that point it became a total strip down, and while I had the bare chassis on the bench, I started playing around with the possibility of fitting a lever group that I had spare. With an extra cross member in the chassis, it would totally work! So, off to see my mate Gonz who worked his magic and welded in a cross piece to take half the group flange. The group was already fitted with cartridge heaters, from back in the days of the Quick Mill Achille testing with Talk Coffee, so why not take advantage of that? Then, why not add some extra precision with a dedicated brew boiler as well? Yep, it would fit with a bit of wrangling. I also adapted a small volume heat exchanger into the existing steam boiler to provide pre-heated water to the brew boiler. Serious overkill at this point but why the heck not?! So, this ended up being the most advanced lever machine I’ve built to date, with a PID controlling the group and a PID controlling a dedicated brew boiler just behind it, temperature control is phenomenal. By tweaking the two set points, you can even control the shape of the traditional lever temperature profile. The original boiler is slightly under-specced at 1700W, but it allows the total machine wattage to stay at approx. 10 amp draw, with 600W in the brew boiler and 200 in the group. It takes a while to reach 1.5 bar, the group is hot well before then – but is ready to go after 25 min approx. and steam pressure is never an issue due to the huge volume for a single group, and added insulation. It’s plumbed in only, as the line pressure primes the brewing circuit and is used for pre-infusion. The spring installed in the group (new of course) generates 10 bar peak pressure. It’s a delight to use and pulls wonderful shots. I’m mad to sell it, but that’s the reality of running a business, I can’t hang on to everything! entirely new brewing system – group, boiler, pre-heater, PID control X2. new autofill controller, SSRs, wiring as required. rebuilt all existing valves, plumbing. Listed at $3700 plus GST, very keen for machinery at this level – it’s probably the most advanced lever machine in the world, in terms of temperature control. Offers in the vicinity will be considered but I have not got much room to move. I am in the process of finalising fitment of the front panel, as it was never intended to cover a lever group. Once that’s done she’s ready to go, will not take me long! As usual, there are aspects of any piece of equipment that can be improved. My main gripe with the Linea Mini is that as standard, the paddle switch is not a ‘real’ paddle switch. Let me explain – the original MP ‘mechanical paddle’ group is much loved by baristas for the control it allows over the pre-infusion phase of espresso brewing. The mechanical nature of the group allows the water flow to be turned on first at a lower, or ‘line’ pressure – this is simply the water pressure present in the mains and through the boiler/group, usually around 3 Bar. When the paddle reaches the end of it’s travel, the pump is engaged, and full brewing pressure (around 9 bar) is applied to the coffee. This two stage operation allows a skilled barista to perfect each shot by allowing the most critical first stage, where we want an even saturation of the coffee bed, to happen at a lower pressure. This improves the chances of the coffee puck saturating evenly, giving us a tastier shot. So, a Mechanical Paddle group is a good thing in terms of control, but, being mechanical, there is a down side. It’s relatively complex to make and thus expensive, and, requires fairly regular replacement of o-ring seals. La Marzocco chose to fit a paddle switch to the Linea Mini, but the important distinction here is that it does not operate a mechanical valve, but a single microswitch which engages the water flow and the pump, practically simultaneously. Thus, the ethos of the paddle is lost because there is no first stage. It doesn’t matter how you move it, quickly or slowly, the result is the same. All this is not to say that it doesn’t work – clearly it does, and well, we just lose out on control over the infusion process. Perhaps La Marzocco chose this for reasons of simplicity – my argument would be all well and good, but if there is a paddle switch present, the expectation is that it works like a real one. Well, we can make that happen! On the pump outlet I’ve added an extra solenoid with an adjustable needle valve, that is switched on as soon as the paddle is out of it’s stop position. This allows the first stage of the paddle’s movement to replicate the line pressure stage of a mechanical paddle group. In fact, the pressure can be set internally by adjusting the needle valve setting to give whatever pressure is desired for the pre-infusion phase. Then when the standard microswitch is engaged mid-way through the travel, the bypass solenoid is switched off and the pump comes to full pressure. In addition I’ve added a spring loaded pre-infusion cylinder to the group to further soften out the pressure ramp-up and decline. The group pressure control ends up being a hybrid of Slayer, Kees van der Westen Speedster and La Marzocco Mechanical Paddle – with the best of all worlds. All electric, no seals to replace and fully adjustable. I’m very happy with the result! The pre infusion modification is available for $1100 AUD inc. GST. At this stage the modification is only available for machines brought to my workshop, and there are no plans to make a kit available as modifications of standard parts, plumbing and electrical connections are required. Complete nuts and bolts rebuild – new legs, chassis powdercoat, and full re-polish of panels. Every gasket and valve replaced. Over a year part time on the project at this stage! A total of three PIDs, one for the coffee boiler and one per group cap via cartridge elements. Steam is pstat/SSR. Power is 25 Amp single phase, about 5 amps more than original. Steam valves converted to lever type, one lock-on direction forward and momentary purge backward. 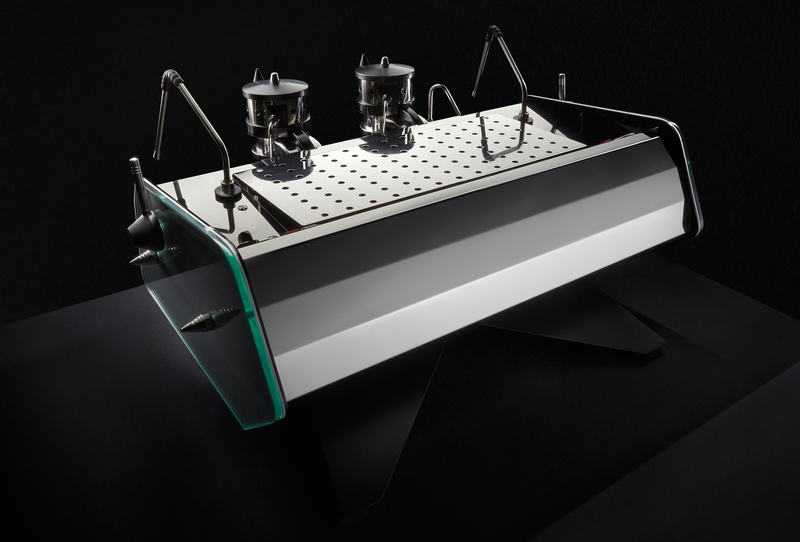 Valve bodies are Nuova Simonelli adapted and feature a LM anti-vac valve on each wand. Custom paddle switch – functionally the same as Marzocco MP group, two stage operation, but electrical rather than mechanical so there are no seals to change. Chronos key pads for shot clock, volumetrics on both groups with a manually controllable preinfusion function. Use either touchpad or manual paddle at any time. I find I like to flush with the paddle and pour shots via the touchpad. Custom made dispersion block in POM-C (same as current Speedster setup) for cleaning ease, temp stability. The Londinium Espresso L1 is a new addition to the market for single group lever machines intended for domestic use. There has been a recent resurgence of interest in lever espresso machines, as we are finding out more about the subject of ‘pressure profiling’, or controlling the water pressure applied to the coffee puck at different stages of the extraction. Andy was a little disappointed with both the fit and finish and the temperature stability of the machine, so we decided to see what we could do to take it to the next level. Without going into too much detail, the Londinium uses a fairly uncommon thermosyphon arrangement to get enough heat into the massive group. After gathering some data on how the thermosyphon functions and comparing this with other user’s data from around the world, it appears that there are conditions that can alter it’s performance, resulting in low group temperatures and sour shots. We considered a few options, one of which was reconfiguring the thermosyphon into a true heat exchanger that operated from mains water pressure instead of the built-in tank, but Andy was keen to retain the ability to run from tank. This meant a drastic alteration of how the group was heated, and the fabrication of a separate brewing boiler to tightly control the water temperature at the group. Luckily, the internal construction meant that the original boiler could be retained and minimal alterations to the layout were required. The end result is a traditional lever machine that has all the inherent temperature controls of a modern dual boiler machine. Changing the set temperature of the brew boiler controller results in a quick change in the idle temperature of the group itself, which governs the temperature profile of the shot. We were also able to address a few of the annoyances with machine fit and finish, such as ease of emptying the drip tray, placement of switches and internal venting of the anti-vacuum valve. Andy is stoked, and the proud owner of what may be the most technically advanced lever machine in the world. 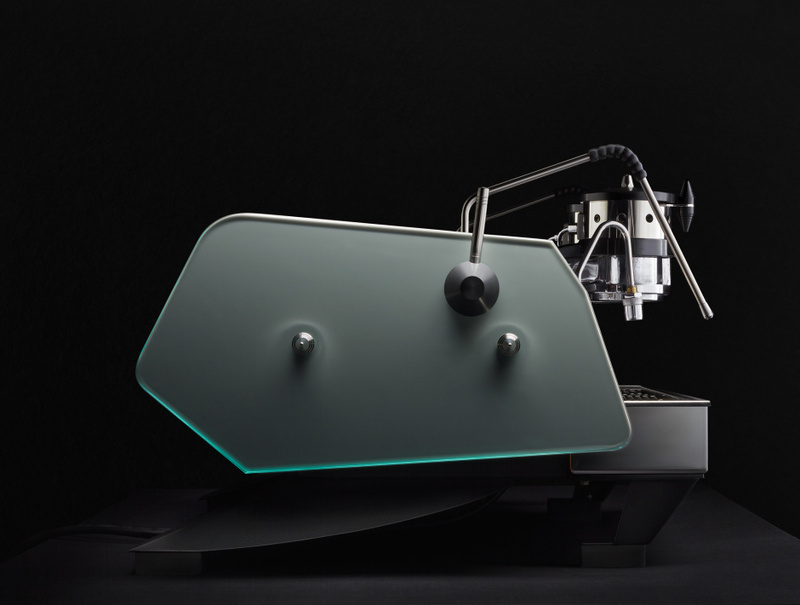 I can’t think of a machine with a worse reputation in the industry than the San Marino but I kind of like them, and machines made by CMA in general (wega, astoria etc). They’re solid, no-nonsense commercial workhorses that may not be sophisticated, but dangit they get the job done. James loves his, and it’s been on coffee duty at his studio for many years. When the element gave up, we decided a thorough overhaul was in order. Predictably, I went a bit nuts and decided to see how well I could make it work. The main drawback with San Marinos is that they lack a thermosyphon – the group is bolted to the boiler and can drastically overheat. The solution in this case is to inject cold water deeper into the heat-exchanger to lessen the need for a hot flush right at the start of an extraction. I also wanted to control the flow rate from the group, which was way too high, by fitting a restrictor to the inlet side of the group solenoid. The finishing touch, apart from a thorough recondition of all valves, sight glass, boiler valves etc, was to add a dual rocker switch for the solenoid and pump – allowing manual pre-infusion control via mains pressure. Many thanks for your all your efforts in resurrecting my San Marino. This machine is at its best and has never worked in this manner ever! As you can see by the lateness of this email – you may guess that I’ve had a couple of long blacks. I bought this little Salda for $10 at a garage sale, knowing it would be a good little machine with a service and a few minor improvements. As standard, single boiler machines including the Rancilio Silvia, Gaggia Classic, Lelit, Nemox, Imat, Quaha and others are perfectly capable of making good espresso though with a few downsides, one of which is a huge variance in boiler water temperature due to their very simple thermostats. This can be compensated for in a few ways, one popular option being to retrofit a PID controller to help regulate boiler temperature more precisely, which is one key ingredient to making consistently good espresso. This is a rather expensive and complicated option (although PID hardware itself is not costly these days – it’s the installation and calibration that can be tricky), and a simpler, more cost-effective modification can be to simply fit a digital thermometer to the boiler giving the user a visual indication of the boiler temperature, which can then be used to time the start of the espresso extraction for the best results. This is known as Temperature Surfing. I ended up taking things a bit further than I’d initially planned, but I reckon this is now the best little single boiler machine around, and makes killer shots with a bit of careful attention to the brewing temperature and pressure. As it’s so simple and small, this is the perfect machine to chuck in the boot with a hand grinder for a weekend away. This was a good example of the sort of horrible condition that many vintage domestic machines imported from Italy are in. Plentiful rust, corrosion, scale, damaged chrome, perished insulation, seals, etc etc. Beware the optimistic eBay description! However, the appeal of these vintage lever machines is justified – once restored, they really are functioning design icons of a bygone era. Luckily, the most important parts of the machine were fixable. The worst case scenario is that the element filament or insulation is damaged, meaning a costly one-off custom element has to be made. Luckily this was not the case and repairing the element just involved re-sealing the terminals with high-temperature insulation compound. These old lever machines fascinate me, and I love working on them. They are always a challenge, but there’s nothing more satisfying than getting a perfect shot out of a machine you’ve restored, and it’s now an asset the new owner will enjoy for many years to come. This beautiful lever dates from 1964, and represents both Australia’s manufacturing and cultural history as it was in Sydney in the 60’s. Espresso bars were gaining popularity, and at that stage the only commercial machines available had to be individually imported from Italy, or brought over as cargo by emigrating families. The story goes that two enterprising continental chaps named Bordignon and Emer got together in their Revesby factory, which at that time churned out terrazzo polishing machines, and decided to have a go at producing a machine locally. The result found it’s way into a few choice locations, and Bo-Ema still produce espresso machines in Sydney, though the company has changed hands a few times, and modern bo-ema’s are not exactly a thing of beauty. The current owner wanted to give it a thorough restoration to working condition while preserving the patina of a lifetime of hard work. With most restorations, the machine is completely stripped down to it’s component parts, everything is meticulously cleaned, polished and reassembled with new parts where necessary, then tested and tested some more. In some cases there are hundreds of hours of labour involved, particularly if parts that are no longer available have to be made – in this case the seals for all the valves had to be custom wound from a mixture of oldschool hemp fibre and modern PTFE. 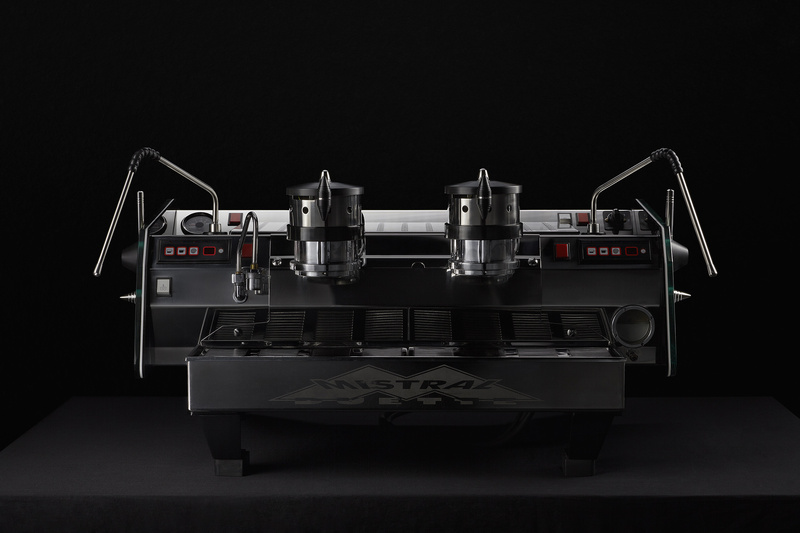 The result was a machine that is working better than when it left the factory 50 years ago – there’s nothing quite like a commercial lever machine and Nic is lucky enough to have one that is a significant part of Australian espresso history.